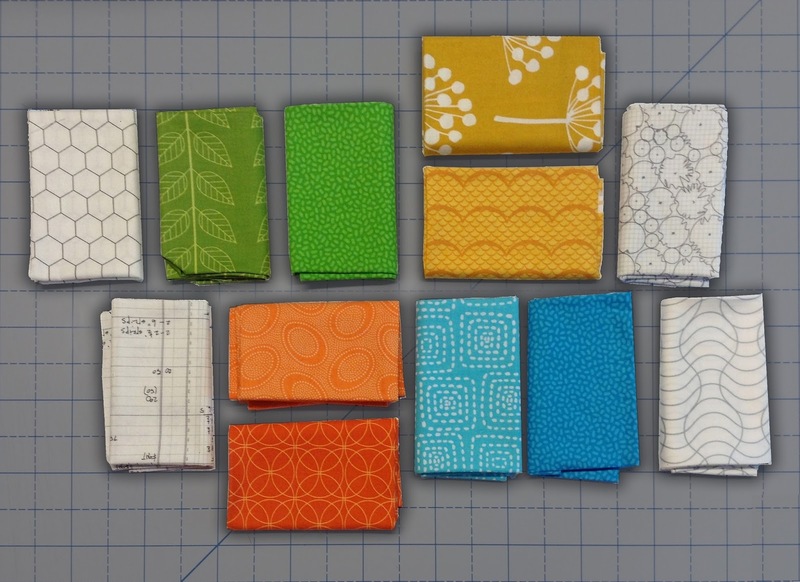 In the hopes of having a completed quilt by the end of the year, we have 2 blocks for you this month! First up is a block from Ann. 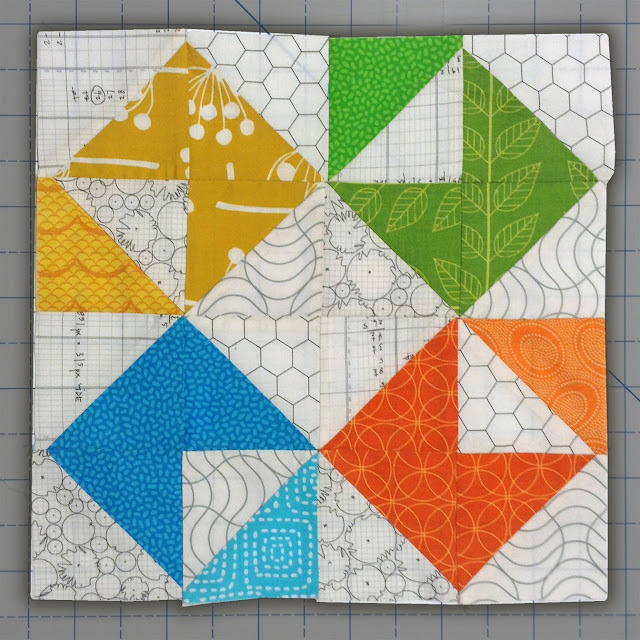 This is the Modern Movement Block by Letty at Happy Dance Quilting, which was offered as a free download from Craftsy. 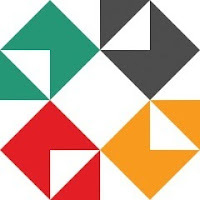 This is a straight-forward Half-Square Triangle (HST) pattern. Start out with four main colors (which comprise 3/4 of the pattern) and then choose a lighter (or darker) tone in the same color range. The designer specifies 1/8 yard of each color and one Fat Quarter (FQ) for the background. Because I would only need a maximum of two 3-7/8" x 3-7/8" squares from the colors, I used scraps from previously cut on FQs. On the heels of our 'Moore Love' raffle quilt that used our logo colors, I carried that scheme into this month's BOM. This included using low volume prints for the background. After the fact, I realized it would have been much simpler using ONE pattern/solid for the entire background, and highly recommend it. (a) 2 from each color. (b) 1 from each color variation. (c) 8 from your background fabric. 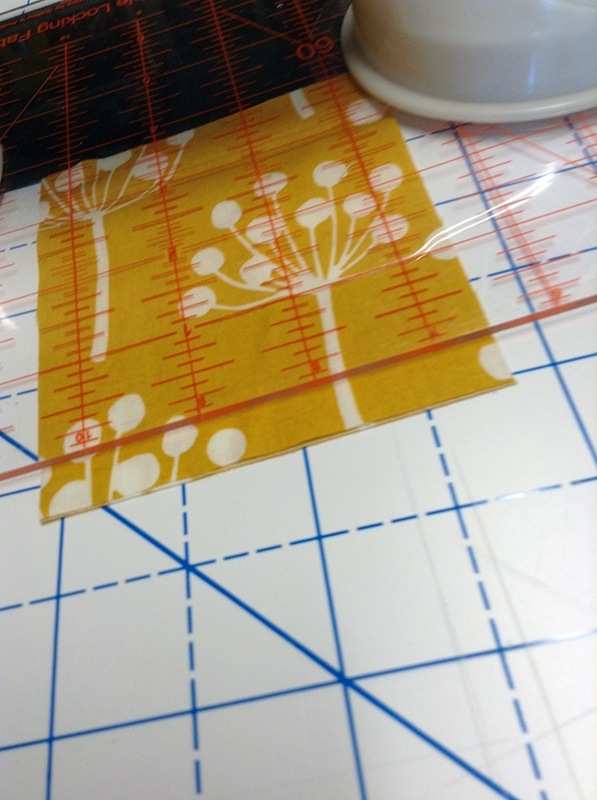 I used my adjustable Westalee ruler to cut my 3-7/8" squares. It's one of my favorite tools. 2. Cut each of the squares in half, diagonally. 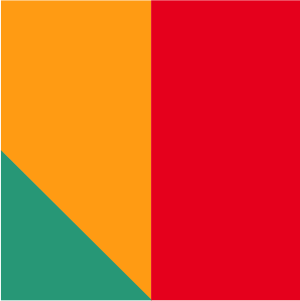 Wrong side of each of the four backgrounds shown with each set of colors. 3. 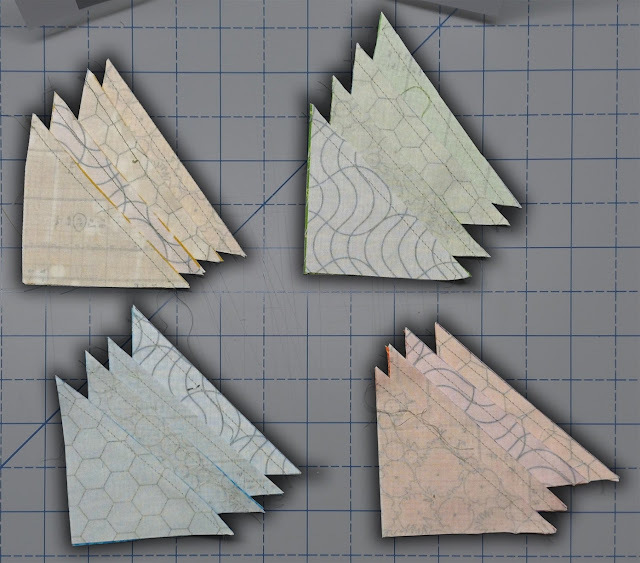 Arrange the triangles following the original pattern. 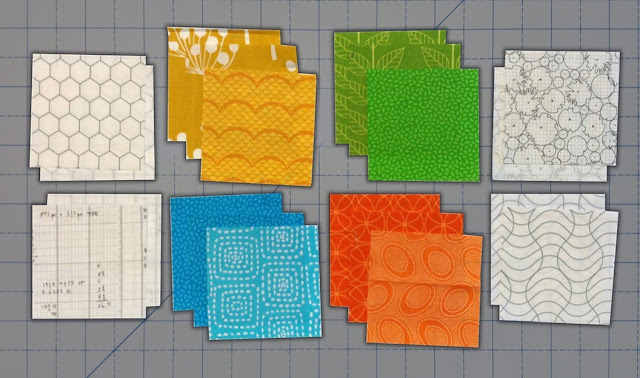 Here are some background options I played with using the four patterns, and also, white. The lower left one is the one described here. 4. 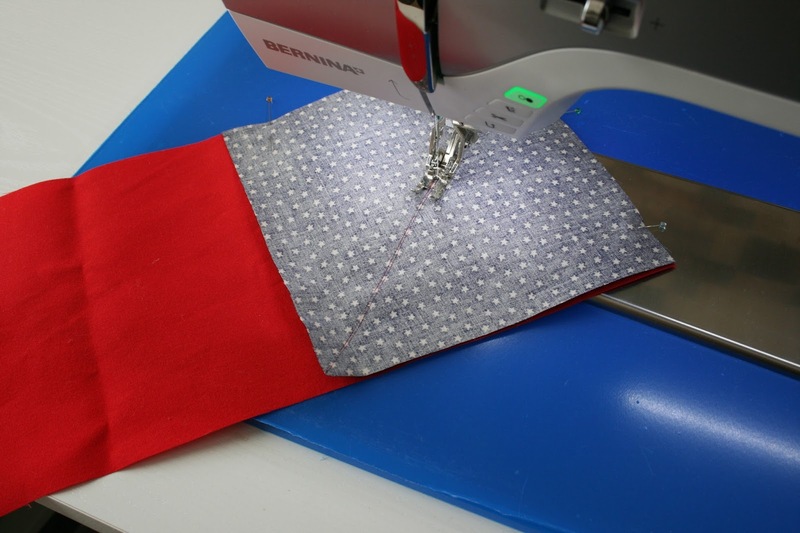 The HSTs are sewn together and then into four rows. 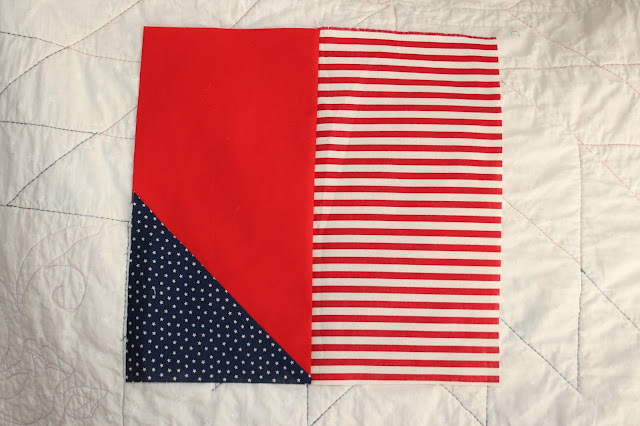 Following the layout and working with 2 HSTs at a time, sew two HSTs RIGHT sides together along that long diagonal edge you cut. 5. Press open units. I did so in a manner that let me nest the seams once they were assembled. 6. 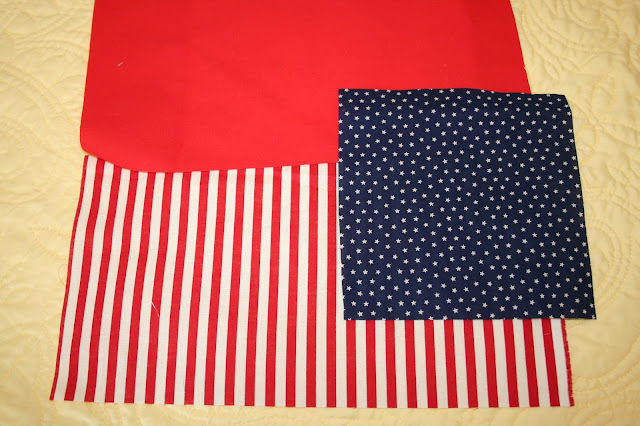 Sew four rows of units together to make completed block. 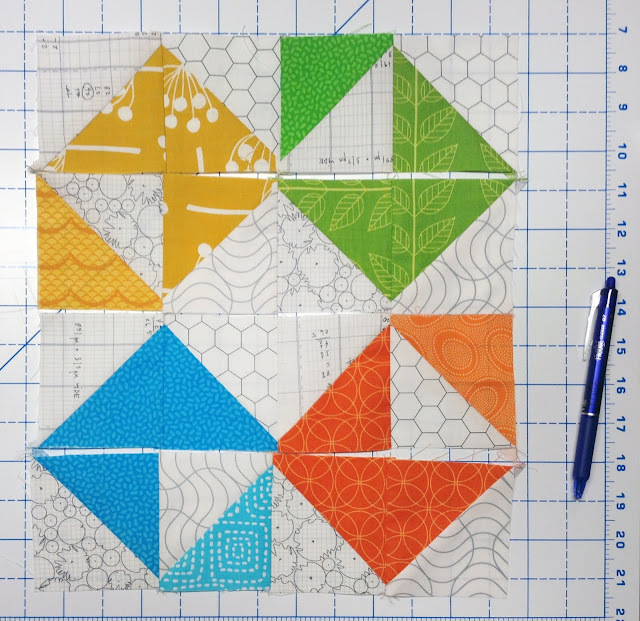 You will use all of the background pieces have eight HSTs [one light and one medium of each color] left over. Our second block is presented by Mandi. 3. Place 6.5" x 6.5" color (b) with RIGHT sides together on lower edge of background color. 4. Draw a diagonal line on the wrong side of color (c) and stitch on line. 5. Trim seam to 1/4 inch and press to side. 6. With RIGHT sides together sew color (a) lengthwise to color (b) and (c) with seam on short side of HST created above. Thanks for joining us! 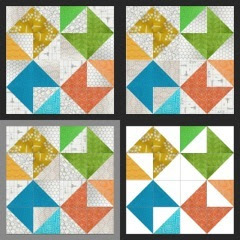 Don't forget to click on BOM on the top menu you catch up on blocks from the previous months and get a peak at how our quilt is shaping up!